Daphnes (Daphne spp.) are a group of shrubs known for the exquisite fragrance of their blossoms. Winter daphne (Daphne odora) is the most widely planted though there are several other species available. All daphne plants are toxic to people and pets. Winter daphne opens its blossoms in mid to late winter, releasing a heavenly fragrance into the air while most plants are still dormant. Winter daphne is a rounded evergreen shrub that grows slowly to about four or five feet tall and wide. It has a uniform appearance in all four seasons with three-inch long glossy, lance-shaped leaves and smooth brown bark. The flowers are pinkish white and about 3/4-inch in diameter. Winter daphne is a delightful shade plant, but has very particular cultural preferences. It will tolerate morning sun, but should be in full or at least filtered shade throughout the afternoon. It needs a location with excellent drainage, regular irrigation and rich, slightly acid soil. Winter daphne is delicate, temperamental plant though it can function as a low hedge if conditions are right. 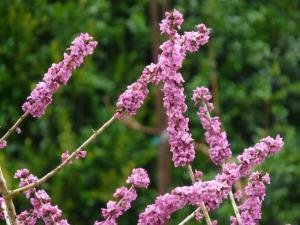 It is best grown as a specimen in a shade garden with a mix of perennial flowers and foliage plants. It is also lovely next to an entryway where its fragrance can be easily enjoyed. Winter daphne is well-suited as a container plant for patios and porches, which is one way to ensure that it has the perfect drainage it requires. 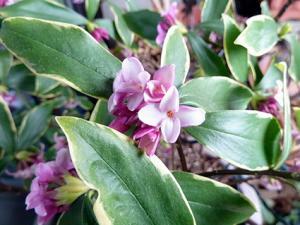 Winter daphne is widely available in retail nurseries during the winter when it is in full bloom. This is the best time to buy winter daphne, but it's wise to keep it in a pot at first to enjoy the flowers up close and then wait until the weather warms in spring to plant it. Loosen the soil for several feet around the planting hole and mix in a two to three inch layer of compost to ensure that the plant has the fertile conditions it needs. 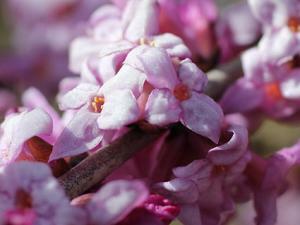 If drainage is poor, sculpt the soil into a low, broad mound before planting winter daphne. Winter daphne should be watered at least once per week, though twice each week is best during hot periods in summer. Maintaining a four to six inch layer of mulch over the root zone is extremely helpful for conserving moisture, keeping the roots cool and preventing weeds. Winter daphne can be trimmed as needed for shape and size, but generally looks best without pruning. Pests and disease are rarely found on winter daphne. Winter daphne is hardy in USDA zones 7 to 9. 'Aureomarginata' is a variegated cultivar with pale yellow leaf margins. 'Zuiko Nishiki' has a more upright growth habit than other forms of winter daphne, growing about three or four feet wide by five to six feet tall. There are numerous other daphne species, but only a few of these are typically used in landscaping. These daphnes are not common in retail nurseries, but can be found online. Together, they offer a variety of other traits. Most daphnes produce attractive red berries in summer while winter daphne does not. They range from sprawling groundcovers to upright shrubs. 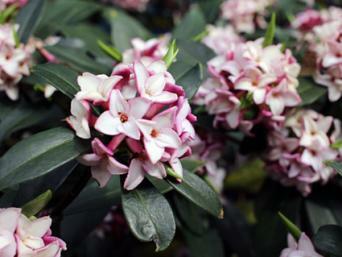 While winter daphne is a very finicky grower in general, it is not particularly susceptible to pests and disease. Other daphnes, however, are prone to a variety of viral and fungal diseases, such as honey fungus and phytophthora root rot. Also known as garland flower, this species has fragrant pink flowers in spring and grows as sprawling shrub just six to 12 inches tall. Rose daphne (Daphne cneorum) is suitable as a rock garden plant and is hardy in USDA zones 5 to 8. Also very similar to winter daphne, the main difference with lilac daphne (Daphne genkwa) is its purplish pink flowers, which grow in elongated clusters like lilac blossoms, and spring bloom period. It's hardy in USDA zones 5 to 7. Burkwood daphne (Daphne burkwoodii) is very similar in appearance to winter daphne. However, it blooms in spring and is more cold hardy. Get the best results by planting in USDA zones 5 to 9. Daphnes belong in the hall of fame for fragrant plants. They are a bit cantankerous to grow, but waking up to their delicate potpourri on a cold winter day makes all the effort worthwhile.